To pick up a passenger at Mineta Airport, you can use the free Cell Phone Waiting Lot, situated on both sides of the Airport Parkway - beween Technology Drive & the the Hwy 87 crossover - and conveniently between Terminals A & B. Stay with your car until your party has collected bags and calls you to be picked up at the curb (no other services available there. Alternatively, 1-hour Express Parking spaces are available at Hourly Lot 2 (for Terminal A) and Lot 5 (for Terminal B) at posted rates. Meeters/Greeters for Terminal B may also park on level 1of Hourly Lot 5 and Surface Lot. For parking space availability, call 408-441-5570. 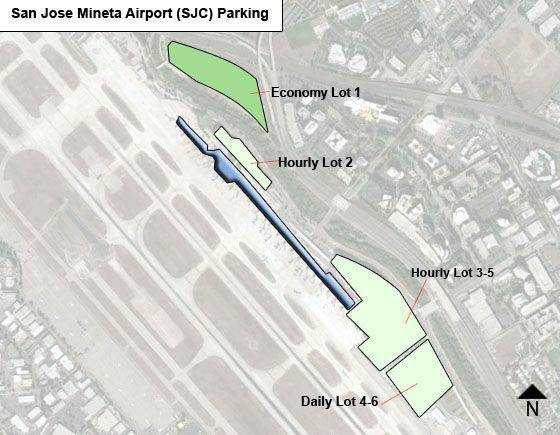 Other Parking Options & Fees at Mineta Airport: While each of the terminals has its own parking garage, Terminal B has also open-air Lots 4, 5 & 6 close to, or nearby. Hourly Lot 2 /Terminal A Garage (at 2075 Airport Blvd., ZIP 95110) - attached to Terminal A, has presently 1,285 spaces, with 30 accessible spaces located on levels 1-3, and 71 one-hr express parking spaces. Clearance: 7 feet, but entry and first level 8 feet. Fees: each 20 minute segment $2; up to daily max $30, and each day thereafter $30. Hourly Lot 3 / Terminal B Garage (at 1659 Airport Bvd. ; ZIP 95110, with entry at first level & 8'4" height clearance. Fees: every 20 min segment $2; up to daily max $30, and each day thereafter $30. Hourly Lot 5 is south of Terminal B and accessed through the baggage claim doors of the rminal. It has currently 546 spaces, 36 of which for for 1-hr Express Parking, 3 spaces are for motorcycles and 8 spaces for charging electric vehicles. Shuttle run to/from Terminal B 4:30am-12:30pm daily. Fees: each 20 minute segment $2, up to daily max $30, and each day thereafter $30. Daily Lot 4 is south of the Rental Car Center Garage with entrance on east side of lot from Airport Blvd. Shuttles run every 10 mins to/from both Terminals A & B. It has currently 400 parking spaces. Fees: each 20-minute segment $2; up to daily max $22. Daily Lot 6 is on the west side of Airport Bld, south of Terminal B and the Hourly Lot 5. It has presently 961 spaces. A shuttle runs to/from Terminal B 4:30am-12:30pm daily. Economy Lot 1 at 2300 Airport Blvd., ZIP 95110, with 1,673 spaces, is past Terminal A and served by shuttles every 10-12 mins/ 24/7. ADA Accessible Parking is available in hourly lot 2 &3. Fees: every 20 mins segment $2; daily max $15, and each day thereafter $15. Payment options use cash at pay stations, or major credit card at exit lanes. There is no cashier on duty. Ticket machines accept $1,$5,$10,$20 bills. Press button for a ticket at any parking lot enrance. At exit lanes, insert ticket, then your credit card and take the printed receipt. Electric Vehicle Charging Stations are located on level 1 of Hourly Lot 2 (Terminal A and International Arrivals garage), and Hourly Lot 5 next to Terminal B. All charging stations are free (on a first-come, first-serve basis). Regular parking fees of the associated parking lot apply. The Hourly Lot 2 garage for Terminal A has both conductive & inductive hook-ups; while Hourly Lot 5 has 8 charging stations with conductive hookups. What is the # of the lot and how much is it a day?